Usually on Mondays my sister calls to chat, and as soon as she does, an interesting bird appears. I have gotten pretty good at pursuing the bird while we chat, phone in one hand and camera in the other. I can even zoom and pan one-handed! Red-tailed Hawk. The white bars down the scapulars are defining marks. And no other hawk have red tails –but I couldn’t get a good look on this cloudy day, and had to wait until I looked at the photo on my computer. Its front shows a white chest and smudged belly band. The dent in its chest showed up in every picture. I have no idea if that’s just the way the feathers grow, or something else. 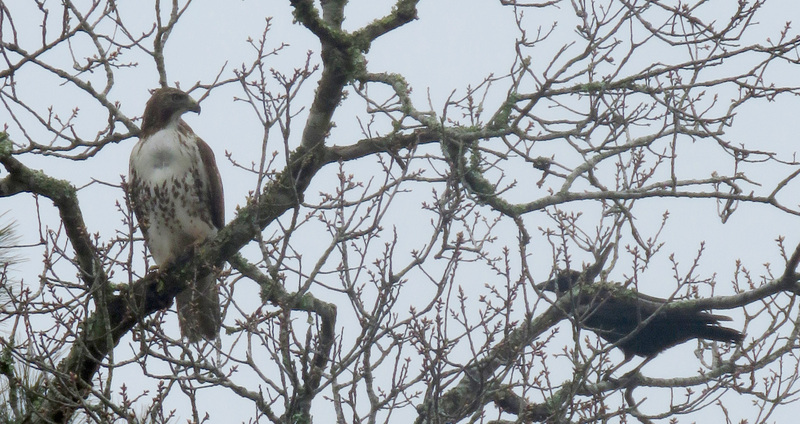 Today it was this beautiful Red-tailed Hawk, accompanied by American Crows. 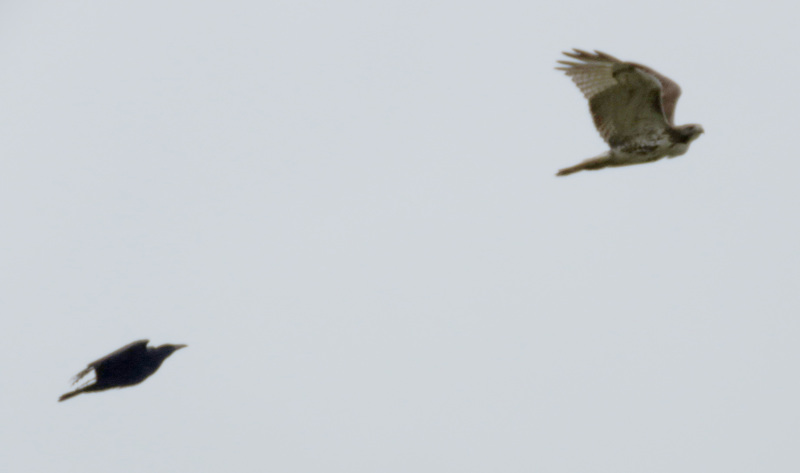 There were three other crows around the hawk too. I often see crows around here, chasing owls and hawks, but because we live in a wooded area, I usually can’t get a good view, much less a good photo. Today everyone stayed out in the open and let me approach pretty close. I always think of Red-tails as being very large, so I was surprised to see that this one wasn’t much larger than the crows. I guess it was a male, because they are smaller than females. Eventually the hawk flew across the pasture and over to the neighbor’s woods. The pictures I got of that were blurry, but I loved the shapes of the birds in flight. The hawk heads for quieter forests. My favorite books for helping with hawk identification are Stokes Field Guide to the Birds, because it shows the different hawks in the same position, so it’s easier to pick up on the differences between species, and Hawks in Flight by Pete Dunne, David Sibley, and Clay Sutton, because it gives so many tips as to appearance and behavior differences. I have the first edition from 1988, which is great but it has only black and white drawings and photos. I just learned a second edition came out in 2012, and it covers more raptors and has color pictures too! Another item for my book wish list! 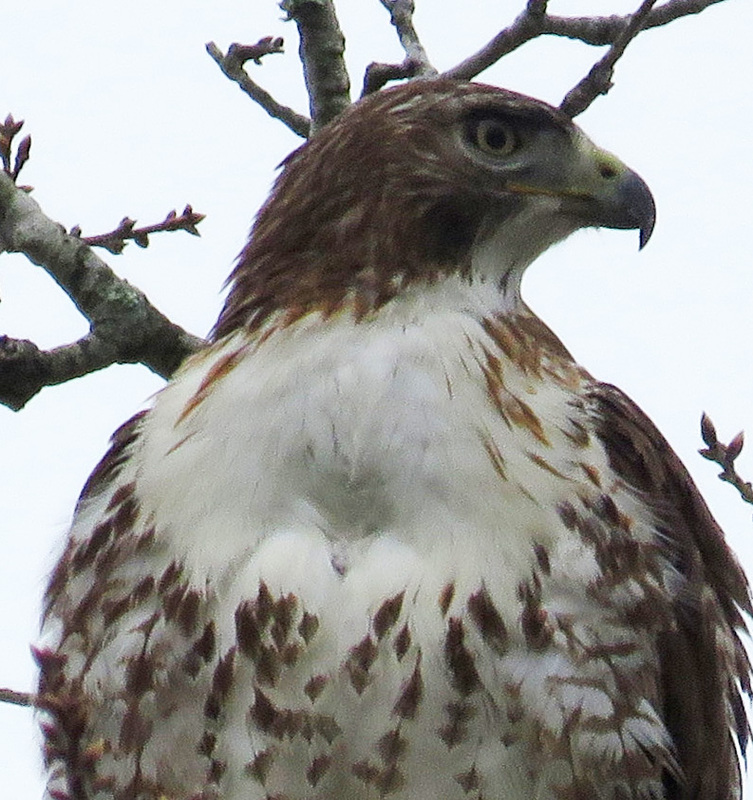 We have red tailed hawks in our area and I too have got a few pics. Must have had a young male learning to hunt as hes visited our area many times, after birds at our feeders. Also in early December, we had one come down after our little dog in back yard but when he saw me he took off. So needless to say I’m out in back yard when dogs are out. Yes, I have seen a hawk go after my ducks when they were out in the middle of our 1- acre pond! He swooped down and almost touched the duck but it swam off. I don’t know what he was planning to do if he missed and fell into the water because he would not have been able to just splash to shore. And, he was just about the same size as they are, so I really don’t think he could have carried one off. Maybe he was young too, and just didn’t know his limits! Hubby n I had been installing g a new sparked on the grill one December afternoon. Both of us were deep in our thoughts when I happen to stand up n heard him squawking. ..when I looked he was a out 8′ off ground n about 15 yards away. He saw me n high tailed it out of there. That’s when we both looked n our littlest dog was right in front of the grill, right in his flight plan. Luckily for her i stood up. Another time he was flying by, saw her n turned around coming back down, only to find me standing way in my hands at him…pesky little guy! The large head-and-shoulders picture is what showed up in my reader. 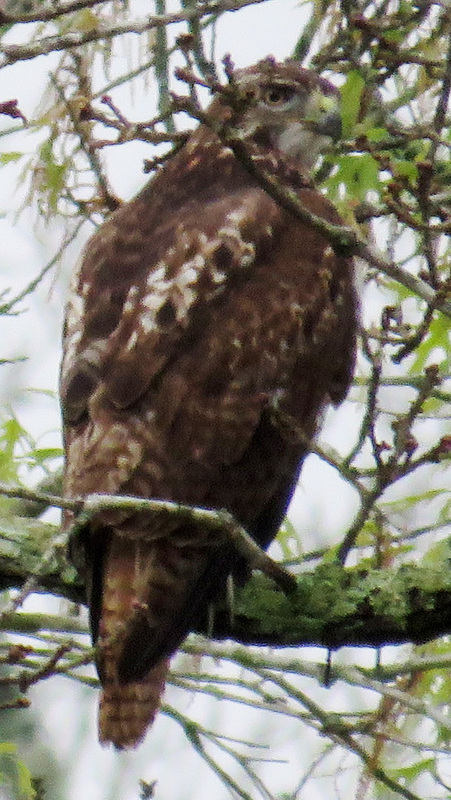 I “knew” it was one of my red-tails. But I figured I better check in to see if I was right! 🙂 The 5 most common raptors around here are red-tails, Cooper’s hawks, kestrels, bald eagles, and vultures. The eagles and vultures aren’t here all the time, but there are a lot of eagles here now! I often see one or two flying over the neighborhood. Thanks for the pictures. Always a good way to start a day. 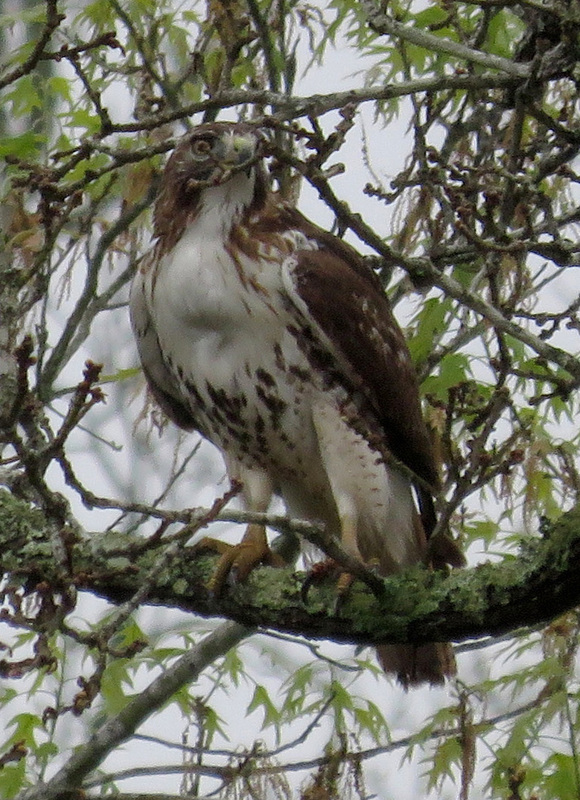 I am so bad at identifying hawks! I always think they should be easy because they’re big. Our most common ones are red-shouldered, and I see turkey vultures and black vultures every day. I see kestrels pretty often, but I have only seen a Cooper’s hawk once. It’s always fun to see them! Great shot! What a beauty!!!! Definitely not the same raptor we saw the other day. I wonder if the “dent” is from pulling feathers to feather a nest? I don’t know! I will have to look up how they molt, too.